MPEG is the standard for coded representation of moving pictures and audio. There are three compression standards: MPEG-1, MPEG-2 and MPEG-4. Since MPEG-1 and MPEG-2 are seldom used, we will make a brief introduction of MPEG-4, which is especially created for streaming video playback. It provides superior image quality with the least data. The biggest pro of MPEG-4 is that it can store DVD image quality files in a small package. So far, there is no specific con of MPEG-4. MP4 is perfect for you to keep videos of this format in iOS devices such as iPhone, iPad and all different kinds of Android phones and tablets. The MP4 format converted by iFun Video Converter MP4 Converter is perfectly fit for iPhone, iPad, iPod, Android based devices, tablets, QuickTime Player and many more. MP4 format is regarded as the most widely used video file format in the industry. Considering its advantages, popularity and the support of other devices & software, more and more people expect and are looking for a free and easy-to-use MP4 converter to help them convert video files to MP4. While, iFun Video Converter MP4 Converter is the best option for MP4 conversion. As an all-inclusive tool, iFun Video Converter MP4 Converter allows you to download and convert any video files including WMV, MKV, AVI, FLV, MOV, 3GP, RMVB and etc. to MP4 format in different resolutions with ease. Moreover, it’sfast and it’s totally free. The MP4 format converted by iFun Video Converter MP4 Converter is fit for iPhone, iPad, iPod,Android based devices, tablets, QuickTime Player and many more. iFun Video Converter MP4 Converter provides ready-made output profile and HD/SD options for iPhone 6/6s, iPhone 6/6s Plus, iPhone 5/5c/5s, iPhone 4/4s, iPhone 1-3GS, iPad 1/2, iPad 3/4, iPad air 1/2, iPad Pro, iPad mini, iPad mini2-4, iPod 1-3, iPod touch 4, iPod nano 1/2, iPod nano 3/4, iPod nano 5, iPod nano 6 and iPod nano 7. First of all, download, install and run iFun Video Converter. 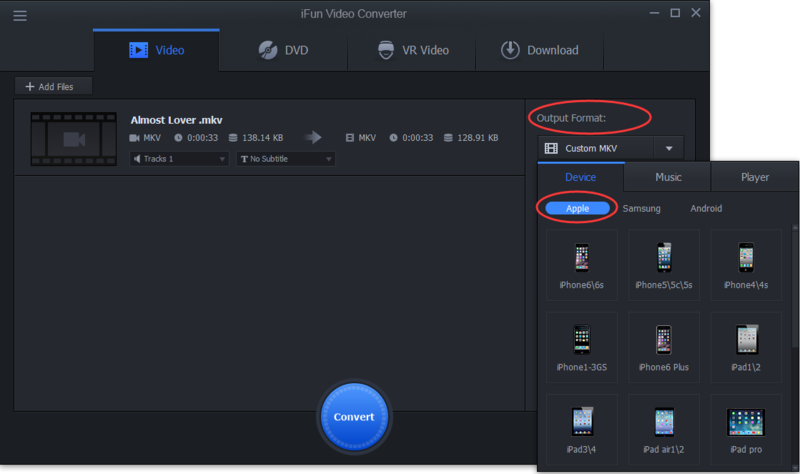 Then, add video files (any format supported) or drag them to iFun Video Converter directly. Open the Output Format drop down menu, and select a proper device option based on your own requirement. And click “Convert” to start converting video files to MP4 format for Apple devices. Developed by Google, Android has the biggest installed base of all operating systems of any kind. In 2015, Android had 1.4 billion monthly active users. Considering the huge user base, iFun Video Converter MP4 Converter now provides a fast, simple and optimized solution for all Android device users.In the Output Format drop down menu, you can make the choice based on the resolution of your Android device. And then, convert video files to MP4 format easily and rapidly.The supported resolution options include 1920 x 1200, 1280 x 800, 1280 x 720, 1024 x 768, 1024 x 600, 960 x 540, 800 x 600, 854 x 480, 800 x 480, 640 x 480, 480 x 320 and 320 x 240.
iFun Video Converter MP4 Converter includes output profile for Samsung S6, S5/S4, S5 mini/S3, Galaxy Note, Note 5/4, Note 3, Galaxy S2/S and Galaxy Tab. Samsung offers one of the most popular mobile phones around the world, and its devices come with high-quality display ensuring you quite great performance. No matter you want to watch your home videos or enjoy films on your Samsung smart phone or tablet, you can take advantages of iFun Video Converter MP4 Converter. This tool will help you convert videos to MP4 format with few simple clicks. 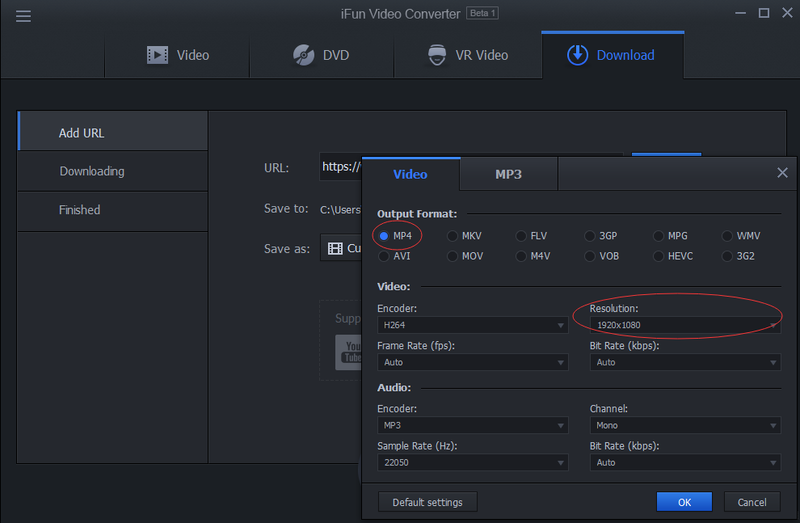 Since iFun Video Converter MP4 Converter has already integrated the output profiles for Samsung devices, you can select your device in the Output Format drop-down menu and convert videos to MP4 by clicking the “Convert” button, no special settings or steps required. Almost all media players can handle MP4 format files very well. To get great experience and performance, you may want to convert video files to MP4 format before watching them on different media players. Fortunately, iFun Video Converter MP4 Converter can help you convert videos to MP4 format that fits for specific media players. Currently, iFun Video Converter MP4 Converter offers you optimized output files for WMP, VLC, KMPlayer, GOM, Zoom Player, Potplayer, DivX Player, RealPlayer, UMPlayer, Jetaudio, BS Player and SMPlayer. The whole conversion process is just as easy as you think. Add video files to iFun MP4 Converter, select your media player in the Output Format drop-down menu, and convert. Are you tired of waiting so long for downloading videos from the Internet? Do you want to enjoy your favorite DVD on Apple, Android and any other Portable Media Player devices anywhere, anytime? Now, iFun Video Converter MP4 Converter can help you achieve this easily.As one of the greatest and most advanced features of iFun MP4 Converter, you can make full use of the feature to convert DVD to MP4 format. Just run iFun Video Converter MP4 Converter, load DVD from your DVD drive, then choose a proper output profile for it, and convert. In addition to converting, iFun Video Converter MP4 Downloader has MP4 downloading feature integrated. It allows you to download videos as MP4 format from popular video sharing websites directly. Of course, you can also convert them to any other format you want.What you need to do is to copy the video url from the video site, and paste it in iFun Video Converter MP4 Downloader address bar (normally, iFun MP4 Converter will help you fill the address bar blank automatically if you copy the correct video address), and click “Download” button. No watermark added and original video quality preserved as well. In the following, we give you an example, and show you how to download YouTube videos to MP4 files in different resolutions (HD, Full HD, Normal and etc.). 1.video custom Setting and conversion: click "save as" option and you'll see "custom" button at the bottom, select MP4 as output format, and choose whatever resolution you want, and click "OK" to save it. Now click "Download" button and finish the downloading. Most popular supported video websites include: YouTube, Vimeo, Vine, Dailymotion, LiveLeak, Aol.On Video, Break, Ustream.tv, Metacafe, veoh, 90smusicvidz, empfilx, eroprofile, extremetube, gaytube, redtube, xvideos and etc. You can follow the steps above and download them to your PC or portable devices. As one of its main features, iFun Video Converter MP4 Converter allows you to convert MP4 files to other video & audio formats easily as well, such as AVI, MKV, WMV, FLV, MP3, AAC and much more. The MP4 format conversion can be completed with just few simple clicks. (HD/Full HD/Normal and etc.) with iFun Video Converter? 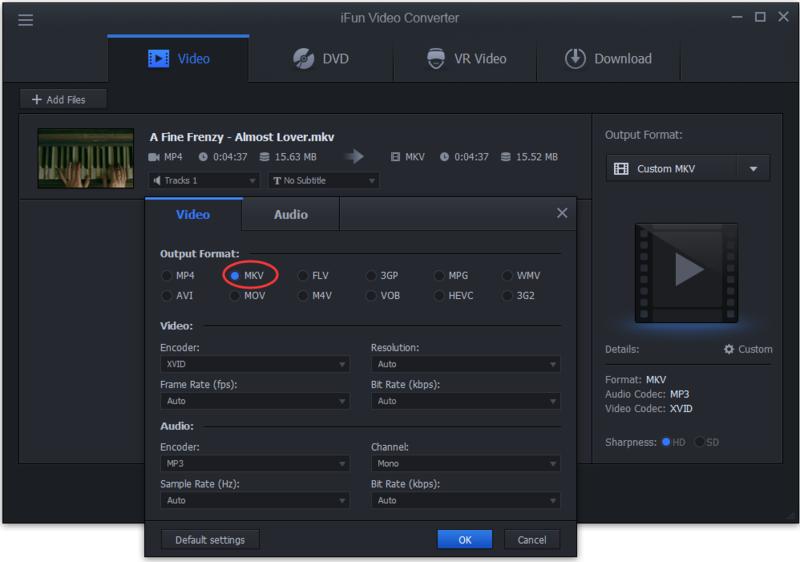 Launch iFun Video Converter, click "+ Add Files" button or drag media files into the interface. You can find "custom" button in the right panel, click it and select AVI as output format, and choose whatever resolution you want, then click "OK" to save it. Now click "Convert" button and finish the conversion. How to Convert MP4 Files to WMV Format? iFun Video Converter is considered as the best way to convert MP4 to WMV format. How to convert MP4 video files to MKV format? One thing you need to do is to choose MKV format as your output format. It’s extremely simple. How to convert MP4 to FLV? Based on your specific needs, you can make full use of iFun Video Converter as MP4 converter and convert MP4 to FLV. With this powerful MP4 Converter, you enable to convert MP4 to 3GP, convert MP4 to MPG, convert MP4 to MOV, convert MP4 to VOB and etc. In addition to a wide range of popular video formats, you can use iFun Video Converter to convert MP4 videos to audio formats as well. iFun Video Converter MP4 converter supports MP3, AAC, OGG, WAV, WMA, M4A, AC3, FLAC and MKA audio formats. How to Convert MP4 Videos into MP3 Format with iFun Video Converter? Add your MP4 videos to the program, and select MP3 output format in Audio Tab, and convert.